Welcome to the starry Ladies Night Restro Bars of Golf Course Road in Gurgaon. Everybody is familiar with the awesomeness of Gurgaon when it comes to party scenes in Delhi NCR. But, did you Golf Course Road in Gurgaon is equally awesome? It is one of the hidden gems of Gurgaon where you’ll find some of the swankiest looking clubs or lounges. Now that you know a little about Golf Course Road, let’s move on to the most important thing (the reason why you read our rant about Golf Course Road above). Ladies Nights Restro Bars in Golf Course Road are loved by many girls out there. Why? Because the lounges or clubs located on Golf Course Road come up with some crazy deals for Ladies Night that our beloved girls fail to ignore. So, what are these deals, exactly? Fantom Bar & Brewery is without a doubt one of the coolest nightlife restaurants in Golf Course Road, Gurgaon when it comes to Ladies Night deals in Gurgaon. Take your girls here on Tuesdays and enjoy unlimited FREE cocktails, mocktails, and beers and groove their groovy music beats! Sounds like an exciting plan, right? Start your week with a bang, and head to Takamaka with your girl gang for their Ladies Night every Tuesday. Groove to their trippy music, drink until you’re wasted, and the best part is all cocktails and mocktails are on the house for ladies. Isn’t that amazing? Spend some memorable time with your girlfriends under a starry sky with soothing retro music playing in the background. Striker Skybar inviting all you lovelies with open arms and giving away FREE cocktails and mocktails on every Wednesday 7 PM onwards. The Last Box is known to be one of the classiest BYOB nightlife restaurants you’ll find in Gurgaon let alone in Golf Course Road. Book your spot here on Thursdays, and spend an eventful night with your sweethearts while enjoying welcome drinks on the house. SouthPoint Carnival is all set to celebrate Superwoman’s day on every Sunday, are you ready to celebrate it too? Do you love freshly brewed beer or delicious wine? Why are we asking this? Well, Because Carnival is out there offering unlimited FREE brewed beer and wine to all the beautiful ladies out there. Be a part of Gurgaon style carnival why having a kickass party with your lovelies. Enjoy the badass ambience of The Biker Cafe bar while partying with your sweethearts on Thursdays in Golf Course Road, Gurgaon. The Biker’s Cafe is offering Sangria’s on the house to all the ladies. So, what are your plans for this Thursday (not sulking we hope)? Why don’t you welcome your weekend a little earlier this week and have an amazing Thursday with your girl gang? Sounds like an interesting plan, right? More Kickass Ladies Night Clubs in Cyber Hub! Yes we know, we said we’ll talk about Golf Course Road but, a little extra information doesn’t harm anybody, does it? So, here is another (short) list of Ladies Night Restro Bars in Cyber Hub, Gurgaon; hope you enjoy exploring these places as well. Happy reading! Hey pretty ladies! Partying in Cyber Hub has always been a weekend affair for most of us but, ever since The Wine Company has started its Ladies Night on Mondays life has got much better (at least for girls). So, what are you waiting for? Book your spot for your Monday parties at The Wine Company and enjoy FREE unlimited cocktails with your girl gang while enjoying Live Performance by Delhi’s one of the top Bands. Enjoy unlimited cocktails and white spirits on the house with your girlfriends at OLLY (one of the best bars in Cyber Hub). Every Thursday OLLY waits for you girls to visit there and have a blissful party with your lovelies. Not just that, OLLY has an Insta Pout wall and OMG PhotoOps which will make your girls’ night out super fun. Doesn’t all this sound super fun? So, when are you planning to have a blissful night at OLLY? Go BANANA on Sutra’s Banana Night starting at 8 PM every Tuesday and enjoy Live Performance by one of the best bands in Delhi (or in India). So, are you ready to make your Tuesdays go BANANA with Sutra? Now, this one here is Cyber City’s one of the most favourite breweries. It serves FREE cocktails and mocktails to all the ladies on every Thursday. Dress your best to party at the best place and let the cocktails bring the craziness to your boring Thursdays. Here we are at the bottom of this long yet (we hope) interesting list of all the nightlife restaurants in Golf Course Road and Cyber Hub, where you can have some fun times with your girlfriends. And, if you need any help to book one of these venues for your group party then, you can get in touch with our team by visiting on our website. We are here for you. So, take the best deal you could, with the help of our team. This was all today! Hopefully, you’ll stumble upon our other blogs soon. Until then, keep the party to make your life beautiful. Adios! 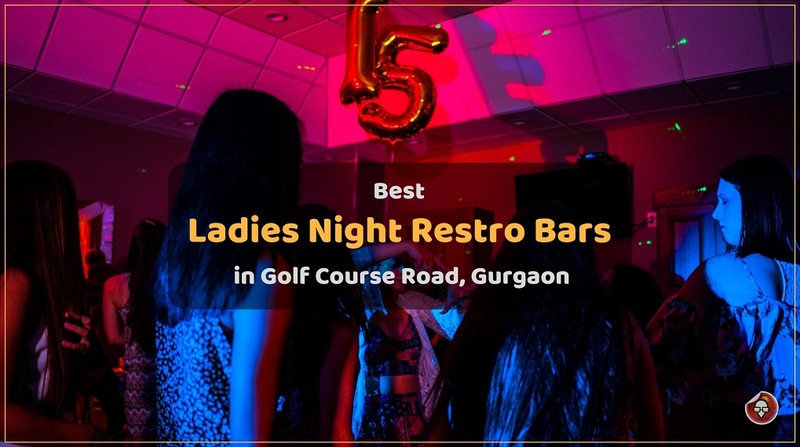 This entry was posted in Ladies Night Parties and tagged bars in golf course road, ladies night in golf course road, ladies night restro bars, restaurants in gurgaon. Bookmark the permalink.